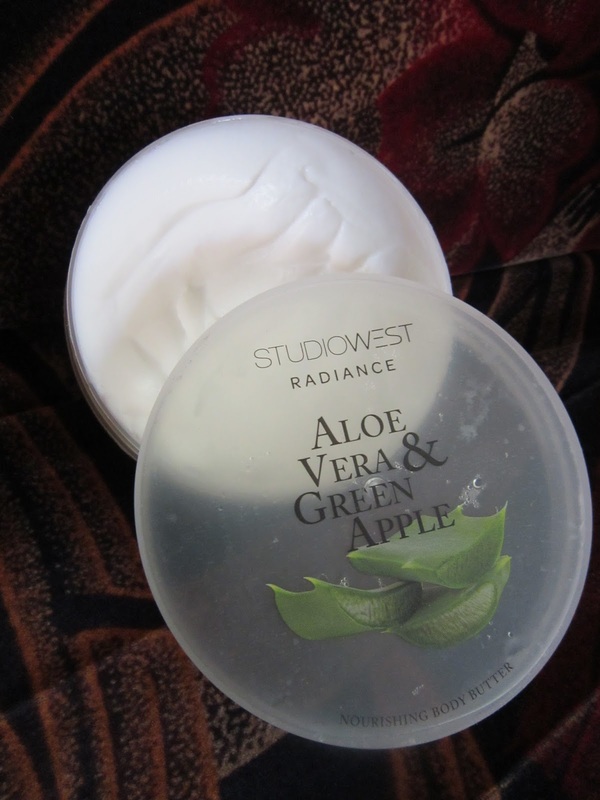 I had been wanting to get my hands on some of the StudioWest products ever since they were launched recently. Somehow, my timings didn't allow me to get to the mall & I settled only to see their pictures on other blogger profiles on Instagram :-P. One of the long weekends, around 3 weeks ago, I had a few errands to run & some shopping to do so I decided to check out the StudioWest line as well. The spray scent is fresh & 'citrus-y'. If you like Green Apple as a scent, you'll definitely love this one! 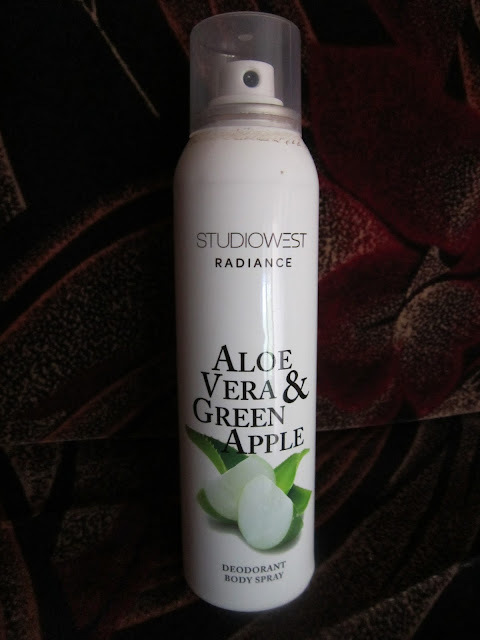 It has a lovely combination of Green Apple & Aloe Vera; you wont feel that one of the scents over-powers the other one. It reminds of summer & I'd have loved to use this during that time, if only they'd launched earlier this year ;-) I have been using this every single day since I bought it. The deodorant hasn't caused any burning sensation or inflammation to my skin, in fact I'd say it's mild but still very effective. The product stays on my skin for about 5-6 hrs even on an 'excessively sweaty' day.. lol sorry to gross you out but hey! I'm reviewing a deodorant right? ;-) I can only say I love the product & this will be a definite repurchase!! This one was a slight disappointment...for a couple of reasons. First, the body butter fragrance does not match the deodorant :-( I was hoping that just like The Body Shop, an entire range will have the same fragrance irrespective of the product for eg. TBS Strawberry Body Butter & TBS Strawberry Body wash have the same scent. The Aloe Vera & Green Apple Nourishing Body Butter by StudioWest doesn't smell anything like the deodorant that I love!! The body butter has a more tangy, more sour fragrance which is a slight turn-off when you try & take a whiff from the tub. Once applied and blended into the skin, the sour fragrance goes away. 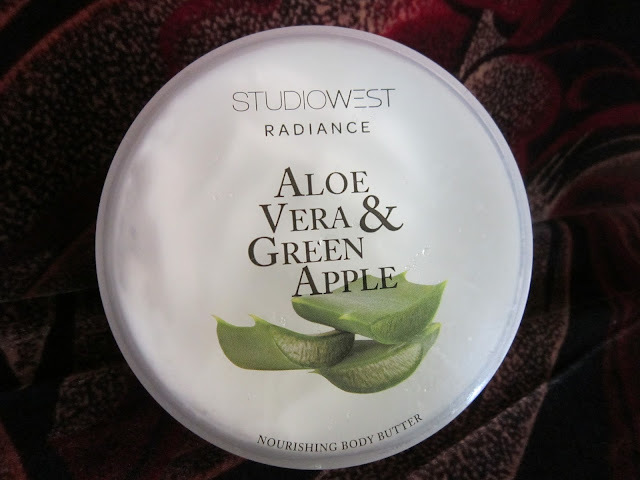 Now I don't know if I got a bad batch, or they made it that way, but for a person like me, who loves "anything Green Apple", the Body Butter scent makes me cringe just a bit when I am using it. Overall I feel, I've had only 50% luck in this haul since I only bought two products. I'm yet to check out their makeup products & will keep you all posted on Instagram, when I haul some! Speaking of Instagram, here's a quick look at the pic I posted there raving about their nail colour. My friend S, whom I'd been shopping with, passed it on to me from her haul. I remember to have applied it on a Saturday & apart from slight chipping at the cuticles, this baby didn't budge till Thursday!! 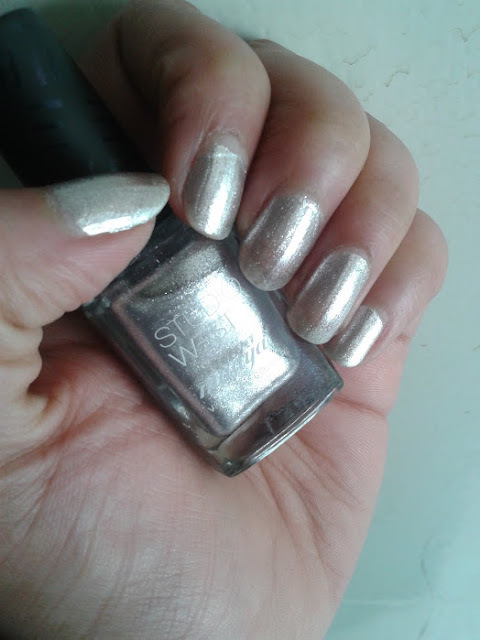 :-) This nail colour wasnt technically part of my haul, but since it's a really nice quality nail colour, I just had to share it with all of you! The nail colours get a 'Thumbs up' from me!! Nice haul. The nail shade looks pretty.